In a quiet moment during our friends’ wedding (Hello Judith and Deborah! ), Cecilia asked: ‘Have you seen the Spanish synchronised swimming team?’ Minutes later the YouTube clip arrived on my phone. It’s an astonishing routine and won the team their first international gold medal in the 2009 World Aquatics Championships. I watched the clip more than a few times and started browsing online for nose clips, waterproof makeup, and synchronised swimming costumes. I had less luck finding a team and made a Twitter appeal. 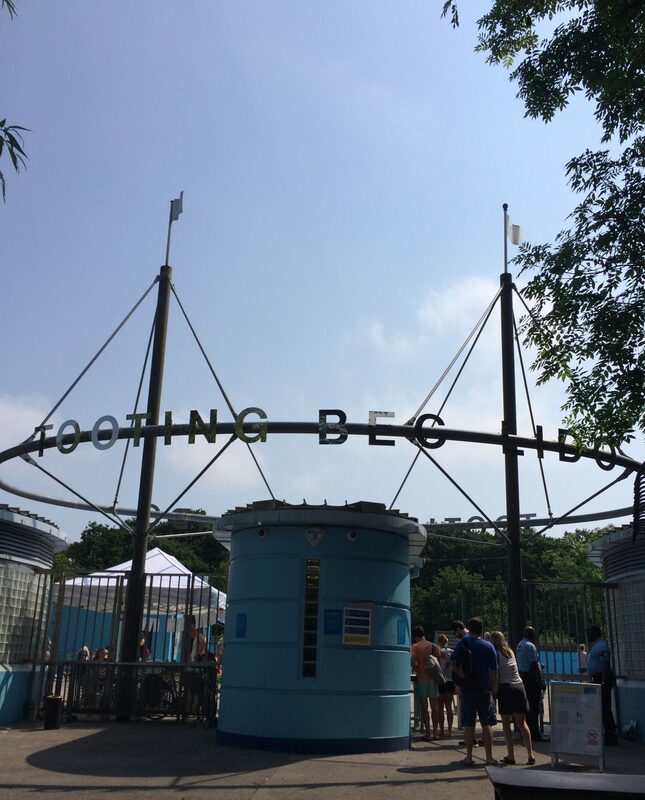 Jenny Landreth, south London’s swimming luminary, put me in touch with South London Swimming Club and the mighty Dive-in Belles. The Belles formed a few years ago and have an unrivalled reputation for their performances at pool parties and in music videos. After a short email exchange, the Belles invited me to join them for their performance at the SLSC annual summer social. To seal the deal, I was sent a list of rehearsal dates (every Friday and Sunday morning), a video of the routine, and a handwritten explanation of the moves. I watched the video with a couple of friends (Hello Margo and Alyson!). Margo scrutinised the video: ‘Do you think you’ll manage the routine?’ I wasn’t sure. 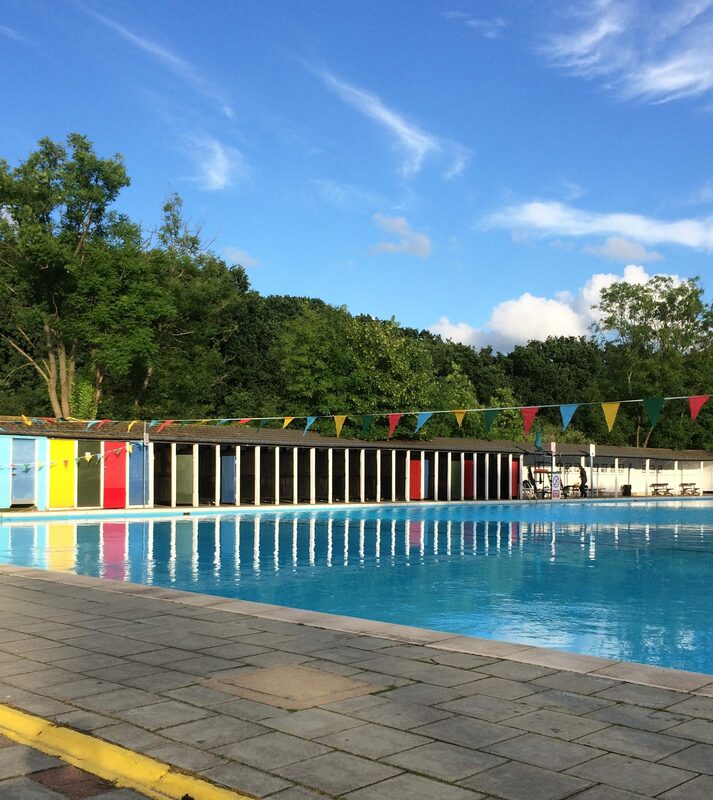 It was a cold day at the first rehearsal and I wasn’t looking forward to plunging into an unheated outdoor swimming pool (Charlton Lido, where I usually swim, is heated). 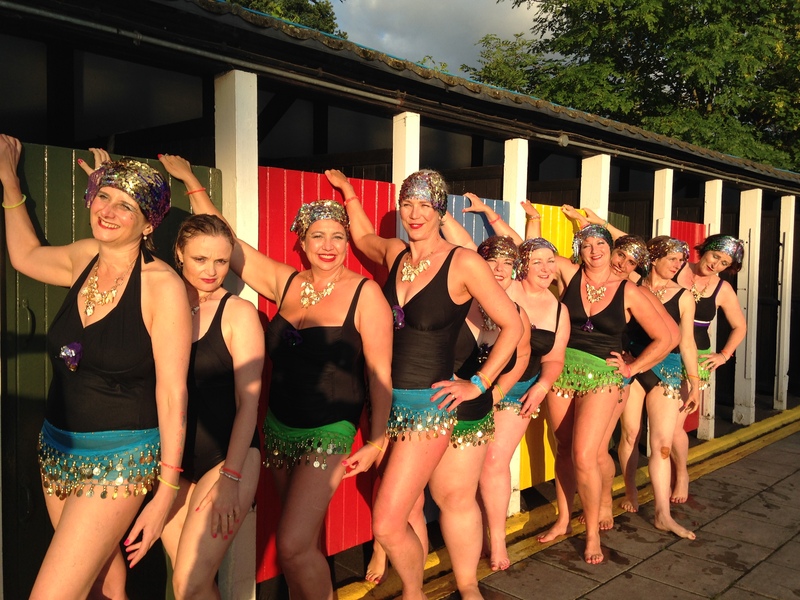 It turned out some of the Belles were also happy to postpone the plunge and we settled for a land-based practice – with musical accompaniment, and unscheduled audience participation. 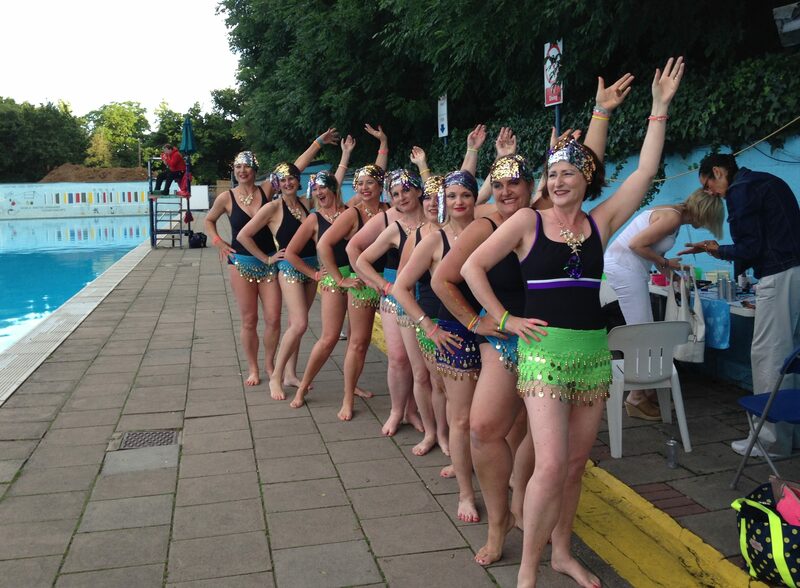 Over the weeks I honed my twice-weekly commute between SE and SW London, reduced my mother to tears as I demonstrated the routine, and continued browsing for nose clips, waterproof makeup, and synchronised swimming costumes. Sue reminded us to wear black costumes on the night, and gave us each a coin-bedecked scarf to tie around our hips. Lucinda provided us with sequinned fabric to tie around our heads and to make a flower decoration for our costumes. Back home I tried on the outfit – a transformation! 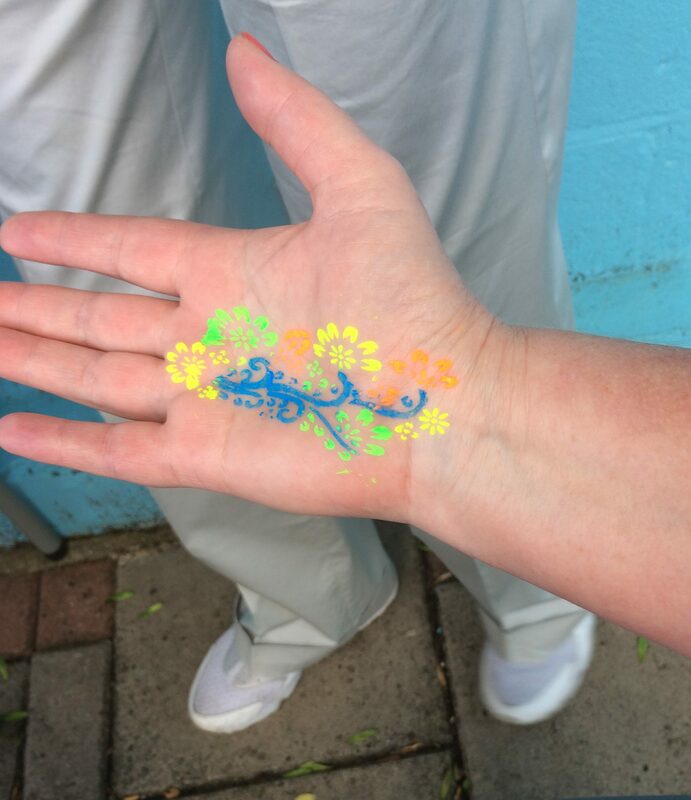 At the next rehearsal, while we were forming the petals of a flower in the pool, Lucinda confided: ‘We saw one of the Olympic teams do this move at London2012. Imagine what it looks like from above.’ We discussed the possibility of using a drone camera to capture the movement until Sue pointed out the light would not be great during our evening performance. A week before the performance, Cherry sent us all email instructions about costumes, makeup, nail varnish. There was special mention of waxing and depilation. Our final rehearsal was the morning after the EU referendum and the mood was subdued. We made final arrangements to the line-up to ensure the shorter Belles would be in shallower water during the routine. After the rehearsal some of us sat in the sun to paint our nails – neon pink on toes, neon orange on fingers. Dazzled by the sun, I managed to use the same colour on toes and fingers and hoped no one would notice. Debby and Cherry did. Hair and make-up (thank you Hazel and Dani!) 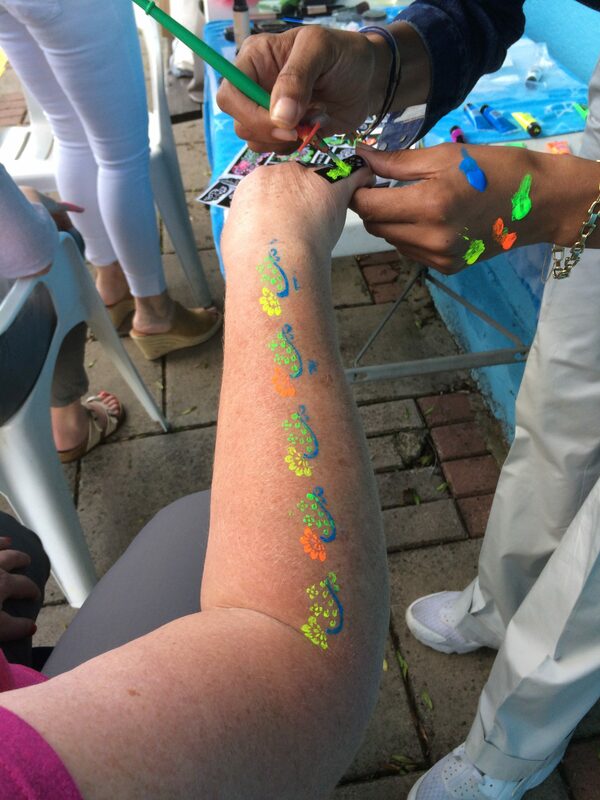 were in full swing when I arrived for the evening’s performance, and I joined the queue to have tattoos applied to my arm, hand, and fingers. After a small glass to steady the nerves we lined up and the music started. Everything was going as planned. Until. The music stopped. We stopped. Wails of disappointment from the crowd rolled across the water. We looked at each other. Like the troupers we’d become, we continued without any musical accompaniment. At the end of the routine, the crowd went wild and, after checking with the technical team, we reprised our performance to even wilder adulation and applause. But this is what you want to see – the second performance of the night. 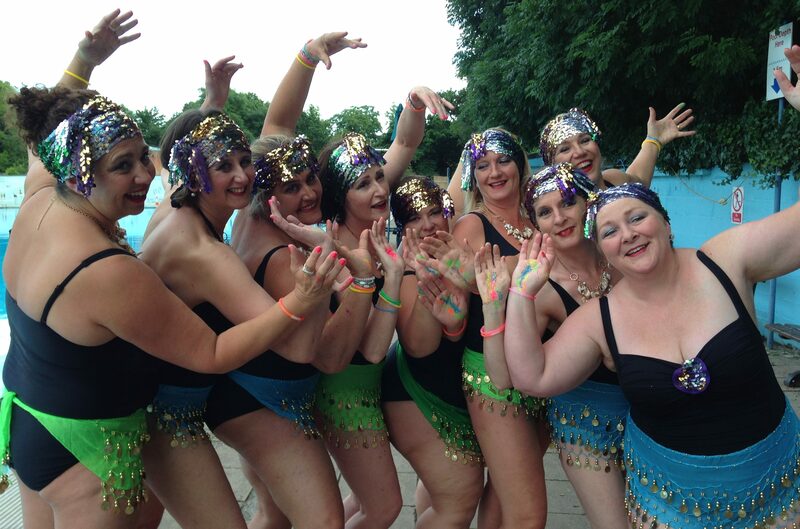 And who knows – maybe I’ll find some synchronised swimmers at Charlton Lido and we can hold a Swim Off with the Belles next year.